Welcome to my 1st of several Super Bowl LIII Preview articles. The match-up is set, the teams are in Atlanta for Opening Night, and today I will be looking at how the Patriots and Rams got here and taking a first look at the match-up. What can we expect from this year’s big game? Keep reading to find out what I think. You can also check out my entire Super Bowl LIII preview schedule below. I will be posting preview articles throughout the week as festivities in Atlanta take place. The Patriots were off to a rough start this season, going 1-2 in their first three games without WR Julian Edelman. However, they brought in WR Josh Gordon to add back WR depth they’d lost in the off-season. Gordon thrived in his first game with the Pats, and when Edelman returned, they made for a dynamic duo that led the offense to dominate. Though they started 7-2, they lost their third game in Tennessee before the bye as TE Rob Gronkowski sat out an extra game after an injury. After the bye, they did win a couple games, playing the Jets and Vikings. But after that their road struggles continued as they lost in Miami and in Pittsburgh. 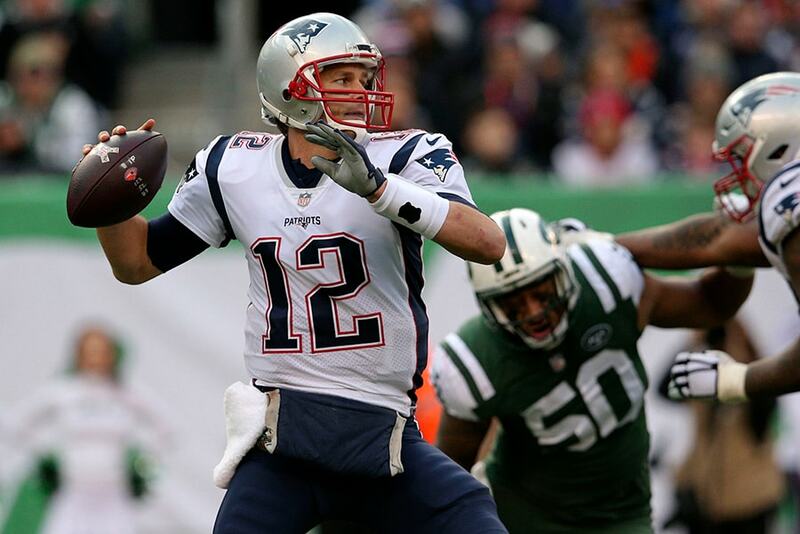 After 14 games, the Pats were 9-5, and they were at risk of missing out on a first round bye. They had the tiebreaker over the Texans, but the Texans were 10-4 at this point. The Pats needed to win one more game than Houston. 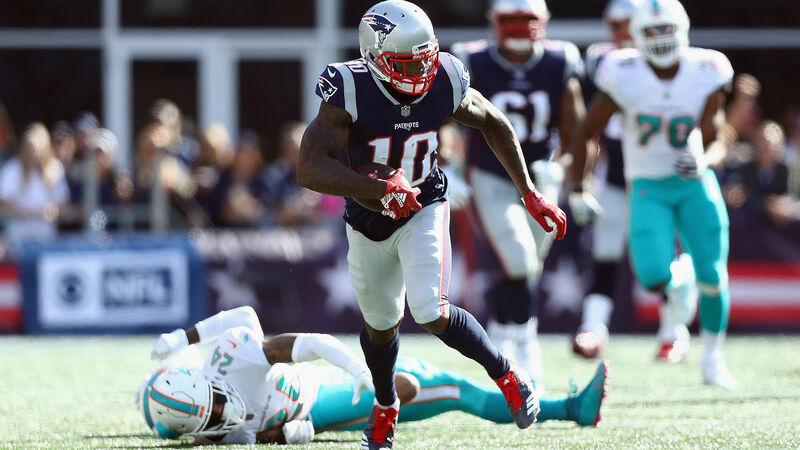 It wasn’t a good sign when WR Josh Gordon was suspended indefinitely once again for marijuana, but the Pats took care of the Bills and Jets easily in New England. They nearly shut out the Jets in Week 17! They did grab hold of the first round bye, but the question was, were these blowouts against the league’s worst a fluke, or were the Pats legitimate Super Bowl contenders? The fans’ doubts were silenced when the Patriots dominated their Divisional Round match-up, hosting the Chargers. They would head to Kansas City to take on the Chiefs in the AFC title game. This was bound to be a close one, especially because the Patriots lost the last time they had played on the road. They were off to a strong start, but they began to fall behind late in the game. With two minutes to go, it was 28-24 Chiefs. The Pats had the ball in what was still a one possession game. They marched down the field and Burkhead scored the TD, but they scored a little too fast. They left enough time for the Chiefs to add a field goal to tie it up at 31-31 and force overtime. After that the Patriots won the toss, and though it was a nail biter with many close calls and 3rd downs, the Pats made their way down the field for the TD, winning the game 37-31! This was Brady’s third OT victory in a postseason game, making him the first player to do so. This was also the first time two playoff games had gone into overtime in one day. The Patriots are now headed to their 4th Super Bowl in 5 years, as Brady looks to ‘Blitz for Six’ and Gronk looks to potentially end his career with a bang. The best part is, as intriguing as a Brady vs. Drew Brees match-up would be, they’re playing the Los Angeles Rams, taking the Brady-Belichick dynasty back to their roots. Back in 2001, Brady led the Patriots to their first Super Bowl victory over the QB Kurt Warner-led St. Louis (now Los Angeles) Rams. You could also compare that victory to this year’s AFC Championship when Brady and co. took down QB Patrick Mahomes II and an explosive Chiefs offense after coming in as 3 point underdogs. The last time the Rams won the NFC was back in 2001, when QB Kurt Warner led an offense known as ‘The Greatest Show on Turf’ to their second Super Bowl in three years. They would face QB Tom Brady and the New England Patriots. Though they had won in 1999, they could not get past Brady and Belichick, who won their first championship together and started a legendary dynasty. 17 years later, the Rams will seek revenge. After Warner left St. Louis, things were ugly for the Rams for much of the 2000s. But in 2015, they began rebuilding, drafting star RB Todd Gurley in 2015, trading up in 2016 to draft the QB of their future: Jared Goff, firing head coach Jeff Fisher, and hiring the young Sean McVay to replace Fisher. To top off their rebuild, they moved back to Los Angeles as they seeked a culture change heading in to the second half of the 2010s. In 2017, Goff, Gurley, and McVay led the team back to the playoffs with help from a star-studded defense led by DT Aaron Donald. However, as the #3 seed, they lost on Wild Card Weekend. The 2017-18 off-season was a busy one for the Rams. The Rams made it clear they wanted to win now, exchanging WR Sammy Watkins, TE Lance Kendricks, DE Robert Quinn, OLB Alec Ogletree, and CB Trumaine Johnson for WR Brandin Cooks, DT Ndamukong Suh, CB Marcus Peters, CB Aqib Talib, and CB Sam Shields. Later in the season, they added RB C.J. Anderson and pass rusher Dante Fowler Jr. as well. They now had one of the best secondaries in the league, Gurley and Anderson made for a dominant RB duo, and WRs Cooper Kupp and Robert Woods broke out, giving Goff a WR trio for most of the season. Kupp has since torn his ACL and ended his season, but the Rams dominated in all aspects for most of the season. After starting 8-0, the Rams headed to New Orleans, where they lost their first game in a shootout. The Rams lost WR Cooper Kupp the next game despite a win. Without Kupp, they weren’t as dominant, going 4-2. But they took care of business against the Cowboys, winning 30-22. They would travel to New Orleans once again for the NFC Championship. They were trailing for most of the game as expected, but they came back to tie it up at 20. The Saints were going for one last drive. When QB Drew Brees threw it to WR Tommylee Lewis, he was hoping for a first down. However, the pass was broken up on a hard hit by CB Nickell Robey-Coleman. I am not alone in my belief that the play by Robey-Coleman was blatant pass interference. But the refs didn’t call it. The Saints made the field goal. But the Rams had time to respond with a field goal of their own. The game went to overtime, and New Orleans won the toss. But after S John Johnson picked off QB Drew Brees, the Rams drove down the field, kicked another field goal, and won the game, 26-23. Saints fans were heartbroken. But the Rams were ecstatic – they had won the NFC for the first time in 17 years. This was only their third Super Bowl appearance, the other two coming during the ‘Greatest Show on Turf’ era. Championship weekend and the weeks leading up to it were very exciting. But moving on to the Super Bowl, the Rams will take on the Patriots in just 6 days. Who will come out on top? Keep reading to hear my initial take on the match-up. This is definitely going to be close. The Pats aren’t coming off a great season by Brady-Belichick standards. They went 11-5 for the first time since 2009, and the first time since their run of seven straight AFC Championships (now eight) began. But the Pats have dominated offensively in each of their last 4 games, and they have motivation going on as QB Tom Brady looks to win his sixth ring and TE Rob Gronkowski looks to potentially end his career with one more. Until this year, Gronk had been spoiled year after year with records of 12-4 or higher. Despite a rough regular season, the Pats will look to make up for it with another Super Bowl victory (which would be Gronk’s third). To get past a difficult Rams defense, they’ll have to use a large variety of plays to try and fake them out. If they are as strong offensively as they have been in the last 4 games, they should be capable of winning this. But the Rams’ D might be the toughest New England has faced since their latest win streak. Coming off a first round playoff exit and a busy off-season that got fans excited, the Rams went 13-3 and earned the #2 seed in the NFC behind only the New Orleans Saints (who they lost to). After being ‘overthrown’ by Brady-Belichick dynasty in 2001, they will look to dethrone the Pats in their return to the Super Bowl. In order to do so, not only will they need QB Jared Goff and the RB duo of Gurley and Anderson to step it up, they’ll need the entire offense around Goff and Gurley to thrive against a mediocre New England defense. Who will win Super Bowl LIII? What is the game plan for each team? What Super Bowl and season-long stats will burden, encourage and/or influence each team? Find out this week as I release more articles each day. I have the Patriots winning it all, though I don’t see them as the most talented team here. I think a favorable schedule, including home field advantage in the AFC Championship after Kansas City’s elimination will help them to a Super Bowl victory. The Super Bowl itself will be an epic battle of two aging superstar QBs, Tom Brady and Drew Brees. It will be close, but I have the Patriots coming out on top. Check out my score predictions and in-depth analysis for all 11 games below. Offensively, these two teams are pretty evenly matched. The Colts have given the Texans a hard time in the past. But on Wild Card Weekend, I expect Houston’s defense to step it up and secure the Texans a victory. While Indy struggles to get into the red zone against a strong Texans D, Houston will score on an inexperienced Colts defense with ease as WR DeAndre Hopkins puts up another huge game. This will be a high scoring game, and it could potentially end up being a complete shootout. Both these defenses lack the experience to thrive in the playoffs. This will allow QB Dak Prescott to find his receivers and lead the Cowboys to victory. However, QB Russell Wilson and his versatile offense will make it close and come within one possession of the victory. With TE Hunter Henry back, this Chargers offense will only get better from here. I think they’ll be able to handle the rising Ravens D this time around. You know what they say: it’s hard to beat the same team twice. This time around, the Chargers D will figure out how to shut down QB Lamar Jackson, RB Gus Edwards, and a talented Ravens offense. It won’t be easy, but I see the Chargers as the only road team to win on Wild Card Weekend. This will be closer than most people expect. QB Nick Foles has unlocked the full potential of the Eagles offense, and it will not be easy for even a dominant Bears D to contain them. But I see QB Mitch Trubisky and his receivers stepping it up and leading a late comeback effort. They will take advantage of the banged-up Eagles secondary and eventually secure the victory in overtime. This will not be an exciting one to watch. The banged-up Houston offense will struggle to put up points, even against a mediocre New England D. Don’t expect Brady the Pats to score much either against Houston’s strong defense. But I see the Pats getting by, as Brady and his receivers take advantage of Houston’s defensive weakness: their secondary. On the other hand, the Patriots’ well-rounded defense will stand strong. No matter who wins in this divisional rubber match, it will be a complete shootout. The Chiefs have next to no defense, which will not serve them well against any playoff team. But will QB Patrick Mahomes II and company put up enough points to get by anyway? In the playoffs? I don’t think so. Mahomes will put up a multi-TD effort. But the Chargers’ revamped offense will dominate a weak Kansas City defense and outplay Mahomes and his squad. Even with Mahomes replacing QB Alex Smith, the Chiefs will choke in the playoffs, again, as the Chargers move on to face New England in the AFC Championship. This will be another close one. But I don’t see this being as high-Scoring as Chicago’s Wild Card Weekend match-up with the Eagles. The Rams have one of the most star-studded defenses in the league. They will severely limit the abilities of a young Bears offense. But Chicago’s D is up there with LA’s. QB Jared Goff has had a good season in general, but he has put up a few duds here and there. After putting up a dud the last time these two teams played, I could see him doing it again. RB Todd Gurley is not at full health and WR Cooper Kupp is done for the year. Goff will find himself short of weapons and will fall short in OT, going one and done for the second year in a row. Dallas will be able to get by in the first round, but wait till they see an elite contender. The Saints should be able to top the Cowboys with ease, even after their defeat in Dallas. This game will take place in New Orleans, and it will be easier on the Saints now that they have an idea of what they’re up against. Brees and his receivers will put up a decent game, but it’s the Saints defense that I could see stepping it up here against Prescott and his young offense. In order for TB12 and the Patriots to take down this dominant Chargers offense, they’ll need to get their own act together offensively. But at Gillette Stadium, I have confidence in them. As long as the Chargers or somebody else dethrones the Chiefs before New England has to play them, the Pats will get the opportunity to play the AFC Championship at home, where they are undefeated on the season. Against a decent Chargers D, Brady will have to use a variety of receivers, and the Pats will have to run the ball occasionally. But I have confidence that they are capable, especially on home turf, though this will not be easy. If this was played anywhere but Gillette, the Patriots would likely fall short to LA’s overpowered offense. Against a tough Bears D, you cannot expect a huge game out of Brees and company. But the Saints have made defensive improvements of their own throughout the season, and I could see them holding the Bears to just 1 TD of their own. The Saints will get by in the end, making the Super Bowl for the first time since 2009. Fun fact: In 2009, the Saints went 13-3, losing to the same opponents as they did this year. They went on to win the Super Bowl that year. In a battle of two star QBs in Brady and Brees, I have the Pats winning it all. But it won’t be Brady who drives the victory. The Saints have succeeded in stopping the run for most of the season, but the at times dominant Pats RB trio might overwhelm them. Meanwhile, Brees will have a strong game here, but I think the Pats’ star-studded secondary will stand strong, holding Brees and his receivers to just 2 TDs. These two things along with a vintage game by TE Rob Gronkowski will lead New England to a 6th Super Bowl victory. I think RBs James White and Sony Michel will shine in this game, and I see the future of this team depending on their success. That’s all for today’s predictions. Stay tuned for more NFL Playoffs coverage and updates soon.